The Fellowship was fortunate enough to obtain a copy of BLACK HAMMER #1 from Dark Horse Comics. Jeff Lemire writes, Dean Ormston draws, Dave Stewart colors, and Todd Klein letters. Ten years ago the heroes of Spiral City fought a huge battle to save the city. Their foe was defeated, but the heroes were transported to a small town. Which doesn’t sound so bad until you try to leave, and can’t. So they remain trapped, with Abe in an aging body, Gail trapped as a nine-year-old, and Colonel Weird in a trippy dreamlike state. But the city is safe, even if they don’t know it, and things are still happening out there. Would living in a gilded cage really be all that bad? Or maybe one person’s heaven is another’s hell. And how exactly does one stop being a superhero? These kinds of questions can do a fabulous job of building characters in a story like this, and just these few brief interactions do just that. The art and colors also work well to fill in some of the blanks in the lives of these people out of place and out of time. Superhero stories are almost always about the character of the people with the powers rather than the powers themselves. And this story shows us an interesting new twist on how heroes think and live. Check it out. 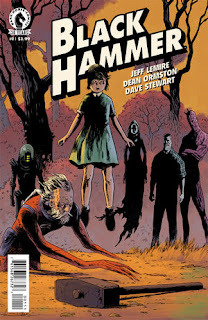 BLACK HAMMER #1 is available now at your FLCS or at darkhorse.com.